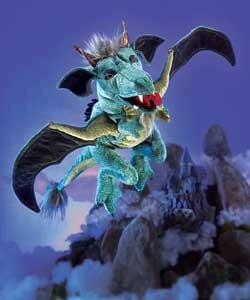 Folkmanis 2958 - Sculpted fabric enhances the ethereal look of the SKY DRAGON puppet. With rich detailing, this spectacular dragon features a movable mouth, forelegs and velvet wings to take flight. This champion of mythical creatures is destined to guide your journey into realms of fantasy. Measures 9” long, 8” wide, 22” tall. Hand puppet with movable mouth, wings and front legs.